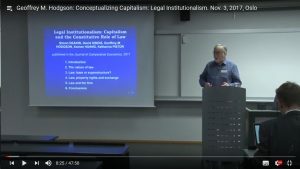 The fifth presentation at our seminar at BI Norwegian Business School (Oslo) is online: Prof. Geoffrey M. Hodgson, founder of Legal Institutionalism, the World Interdisciplinary Network for Institutional Research WINIR and author of the book “Conceptualizing Capitalism”, gives an introduction to the legal institutionalist perspective. After clarifying the nature of law (vs. custom) and arguing that law cannot be pushed into the “superstructure” as an epiphenomenon, he provides two powerful examples demonstrating the constitutive role of law for capitalism: property rights, and the theory of the firm. By conflating property rights with mere possession, the field of “economics of property rights” entirely abstracts from the legal institutions necessary to guarantee and enforce property rights: a state guaranteeing and enforcing private (property and contract) law, including a system of civil courts. Viewing the firm the way lawyers routinely do – as a fictitious legal person – solves a number of problems in the theory of the firm literature in a straightforward way and demonstrates the integrating power of a legal institutionalist perspective.